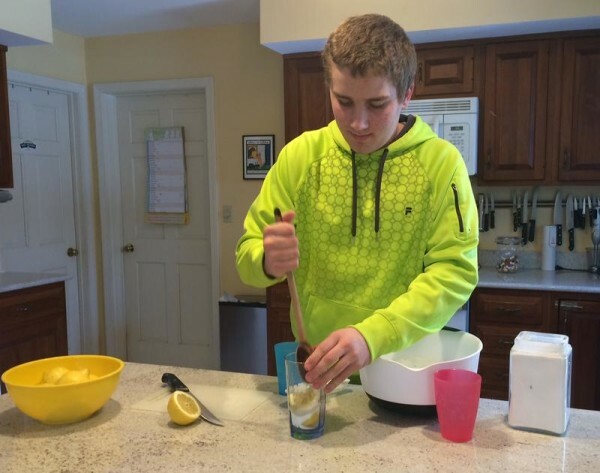 Nat Jordan, 15, of Cape Elizabeth, has been making his own lemonade for years, and now hopes to bring his recipe to Portland in the form of a mobile lemonade stand. CAPE ELIZABETH, Maine — While most 15-year-olds get summer jobs at grocery stores or pizza places, Nat Jordan has decided to do something a little more entrepreneurial. The Cape Elizabeth High School sophomore is starting his own business, LemonCycle, and plans to launch it this summer in Portland. Jordan is putting a twist on the classic lemonade stand: he plans to use a tricycle with a cart built on the front to ride around and sell homemade lemonade. He said that while he grew up selling from a stand, he’s now too old for that. “I did a lot of [lemonade stands] in front of Fort Williams, but as I got older it’s kind of awkward,” he said. Jordan is still in the process of finalizing the business and still must buy his equipment and obtain permits. He has a Kickstarter page through which he hopes to raise $2,500 to cover the start-up costs. Jordan said he plans on building the cart, which will include a cooler, a sink, counter space, and storage. He also needs a permit from the state health department and a pushcart permit from Portland, which he believes will total around $400. Jordan said he likes the idea of having a mobile lemonade stand because it’s practical, and because he can’t drive. “I wanted to start a lemonade stand and I wanted to do a push cart, but I’m not old enough to have my license to get to Portland,” he said. Jordan plans to make what he assumes will be a 45-minute tricycle ride to the city each day. Although it would be quicker and easier to bike to a regular job, Jordan said he’s not interested in getting locked into that kind of schedule. Jordan said he’s always been interested in being innovative. Although the idea of a lemonade stand isn’t new by any means, most people don’t put them on bicycles. Jordan said of the dozens of food trucks and stands in Portland, he doesn’t know of any that exclusively sell drinks. He said this will make him unique and he thinks people will be interested. “I haven’t done any market research, but I’ve seen all the people who would drink it,” Jordan said. He said he knows that many people walk around Portland in the summer months and he’s guessing, and hoping, they’d be thirsty. He said he hopes to park his bike in sections of the city where people congregate. “I’m hoping to find a spot on Commercial Street or in the Old Port, or somewhere busy,” he said. Jordan said at first he’ll be selling lemonade and limeade, and hopes to eventually sell strawberry and cherry lemonade. To start he will sell one size, a 16-ounce drink, for either $2.50 or $3. Jordan said he wants to provide people with something satisfying on hot summer days. “I want to quench people’s thirst and make them happy,” he said. Jordan said that while he believes he’ll be a success, his friends at school have shared their doubts. Jordan said he’s looking forward to trying, though, and even if the business fails, he knows the experience will be a valuable one. He hopes starting his own business at a young age will pay off when entering the career field in several years. LemonCycle doesn’t have a website yet, but it can be found on Facebook and Twitter.